The 2012 RECOVER evidence evaluation process unearthed numerous knowledge gaps relevant to veterinary CPR, and these findings allow developing a prioritized research agenda for impactful conduction of research in the field. Some questions are best addressed by conducting focused experimental or clinical research projects, while much new knowledge can be gained from information contained in a large medical database such as a registry. For example, how is the duration of CPR associated with ROSC and survival to hospital discharge? Does resuscitation team size matter? In animals with sustained ROSC, how is the functional capacity of the dog or cat improving over time? RECOVER therefore developed a data framework for a small animal CPR registry and this work was published in JVECC in 2016 (Utstein‐style guidelines on uniform reporting of in‐hospital cardiopulmonary resuscitation in dogs and cats. A RECOVER statement). Based on that work, an online CPR registry to include dogs and cats was constructed by RECOVER and is now overseen, further developed and maintained by the RECOVER Registry Committee under the leadership of Drs Deb Silverstein, DACVECC and Anusha Balakrishnan, DACVECC. A challenge that we encountered in the early trialing phase of the registry is the transfer of high-quality data from the bedside (e.g., where CPR is conducted) to the registry. A CPR record sheet was identified as an essential “interface” between the CPR codes as they occur in real life and the data to be entered into the registry. Such a CPR case report form (CRF) needed to fulfill several functions. It needs to be intuitive in use so that minimal training would be required for veterinary personnel. The formatting should be such that data entry flows naturally with the progression of the resuscitation effort. Free text entry is to be minimized to reduce the need for time-consuming handwriting and to eliminate issues with poor readability. The CRF simplicity is challenged by the requirement for the capture of a complete set of data deemed essential for the registry. The data on the CRF must further be presented such that it can be easily transcribed into the online registry entry form under avoidance of any ambiguity or transcription errors. And last but not least, the CRF must fulfill the general requirements of any document destined to be part of a patient’s medical record and be usable across a wide range of practice settings. A task force was therefore brought to live to tackle the development of the CPR CRF. The group was co-chaired by Dr. Anusha Balakrishnan, DACVECC and Ms. Larraine Lage, VTS (ECC) and included a team to design each page of the form and a team to review a large number of forms already in use in various veterinary hospitals. Dr. Manuel Boller, DACVECC consulted on the link between the CRF and the CPR Registry and Kenichiro Yagi, VTS (ECC) provided essential organizational support to move the project forward. 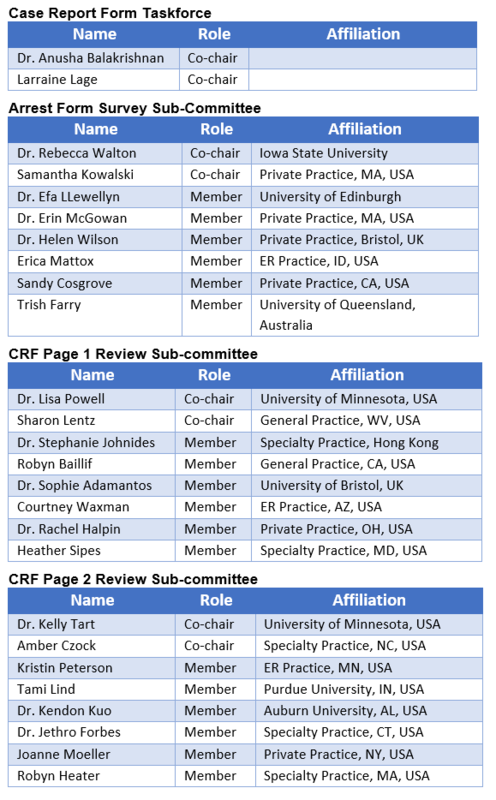 After 6 months of work, many conference calls and design drafts the CRF task force is now happy to present the veterinary CPR community with the first release of the RECOVER CPR record sheet. One of the main attributes of this new form is the focus on ease of use and simplicity, allowing for use by a wide variety of veterinary professionals with different levels of training (including veterinarians, veterinary technicians, assistants, and veterinary students) and diverse hospital settings (academic institutions, private practice emergency/specialty hospitals and general practices). The CRF aims to be thorough, yet simple and easy to follow, with the goal of making data entry intuitive and straightforward. The form comprises two sections- Page 1 and Page 2. Page 1 contains information that should be filled out in real-time as CPR efforts are being undertaken for a given patient, and can be used by hospitals as a tool for CPR recording and monitoring. This includes data pertaining to resuscitation efforts during CPR, such as drugs administered and monitoring parameters (i.e., ECG and ETCO2 findings), as well as time intervals. Page 2 contains information that can be recorded retroactively. This includes information pertaining to the patient’s systemic health, primary health complaints and suspected cause of cardiopulmonary arrest, as well as any other systemic co-morbidities suspected or known, along with illness severity scores. It also asks for information regarding patient outcome and in the case of patients that are successfully resuscitated for a sustained period (>20 mins), for data on functional capacity post-arrest. The CRF can, of course, be used independent of the registry, but all verbiage included is synonymous to that in the registry. The form can be downloaded and used by anyone who wishes to do so. We expect that this form will be changed as time evolves and experience with its use mounts. Therefore, any comments you may have are welcome! Please email Dr. Anusha Balakrishnan (anushabalakrish@gmail.com) with your feedback. This form would not have been possible without the many volunteers that contributed their expertise, creativity and time to the project. We would like to thank the Page-1 team (Dr. Lisa Powell, DACVECC; Sharon Lentz, VTS (ECC)), the Page-2 team (Dr Kelly Tart, DACVECC; Amber Czock, VTS (ECC)) and the CRF Review Team (Rebecca Walton, DACVECC; Samantha Kowalski, VTS (ECC)), Dr Manu Boller and Kenichiro Yagi as well as the many others that shared their CPR record sheets or contributed otherwise.